The Flash Season 3 Episode 12 Spoilers, Air Date, Promo, 3×12 Synopsis: The upcoming episode 12 of Flash season is titled as ‘Untouchable’ which will see a very nasty meta-human criminal disrupting the lives of normal humans in the Central City. In the last ep which aired on Tuesday, Gypsy created enough problems for the team Flash. In the coming segment, the fans would see the scarlett speedster training the Kid Flash to fight the dangers in the future. The Flash promises the Kid Flash to mentor him the best. Below are some the spoilers for the upcoming episode of the series. Also, it is a preview along with the promo video and synopsis available here. The Flash episode 12 of season 3 introduces a new villain named Clive Yorkin who is a criminal meta-human. Based on the episode’s official synopsis, it is revealed that he is on a killing spree with his meta-human ability of decomposing anything at a very fast rate. He uses his skills to create havoc in the Central City by accelerating the decay of bodies which eventually leads to their death. Yorkin sets Joe as the next target, but Iris West gets caught in the crossfire when Barry Allen and the team at STAR Labs proceeds to stop him. Clive Yorkin is a wanted criminal. Impostor actor Matthew Kevin Anderson will portray the criminal character in the coming chapter. Clive had a history of a career criminal and was imprisoned for a number of crimes. Yorkin gets his only chance of release by becoming a part of an experiment named Nephron Process. He didn’t let his chance go away and bags it. But, the process leads to a reverse effect on his body which makes him insane. In the meantime, the fans would get to see The Flash mentoring the Kid Flash by taking his training to the next level to hone his skills and powers. THE TOUCH OF DEATH – Barry (Grant Gustin) and the team at S.T.A.R. Labs work together to bring down Clive Yorkin (guest star Matthew Kevin Anderson), a criminal meta-human who is methodically killing people by causing them to decompose at an accelerated rate. Joe (Jesse L. Martin) becomes his next target but it’s Iris (Candice Patton) who is caught in the crossfire. 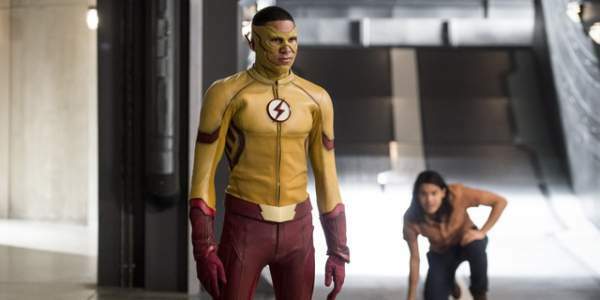 The Flash mentors Kid Flash (Keiynan Lonsdale) and begins to elevate the newer speedster’s training to another level. Rob Hardy directed the episode written by Brooke Roberts & Judalina Neira. In the promo video of The Flash s3e12, you can see the network, CW teasing the character and gives glimpses of Barry training Wally West. The Flash season 3 episode 12 air date is February 7 at 8pm ET on the CW. Stay tuned to The Reporter Times for latest news on the TV series and other Entertainment segments.